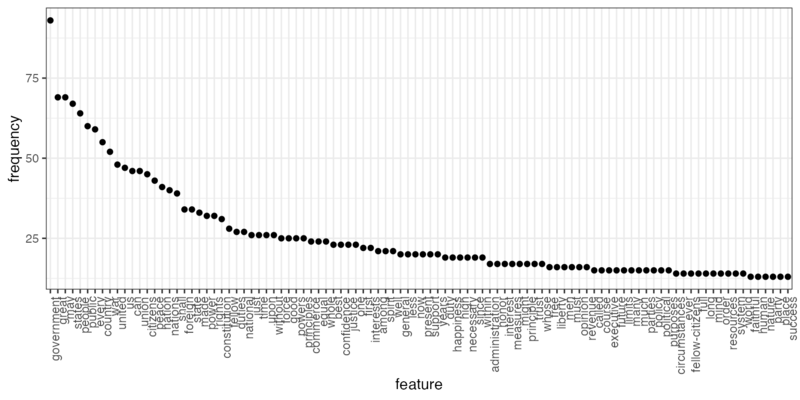 This vignette walks through various plot options available in quanteda through the textplot_* functions. 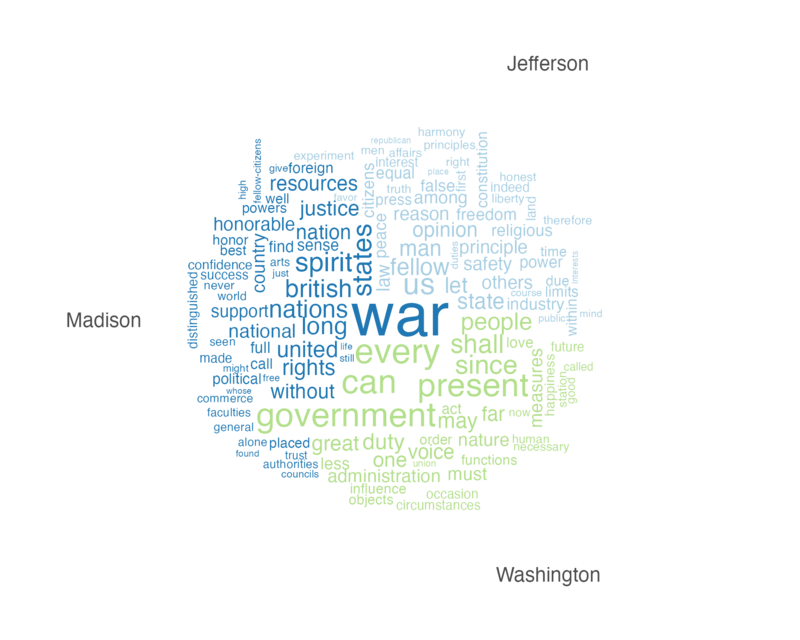 The frequency of features can be plotted as a wordcloud using textplot_wordcloud(). 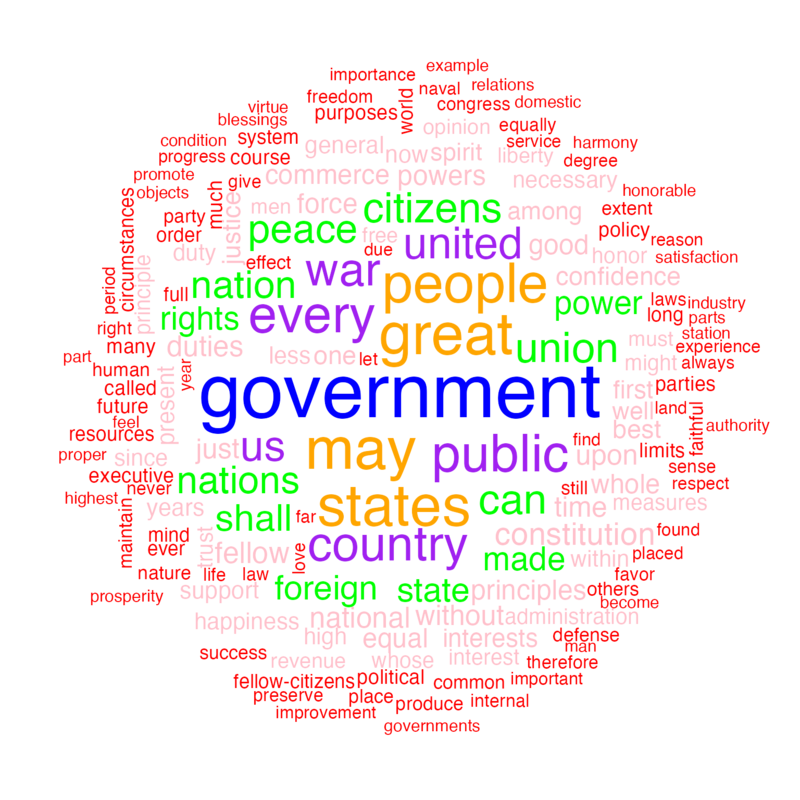 Plot will pass through additional arguments to the underlying call to wordcloud. 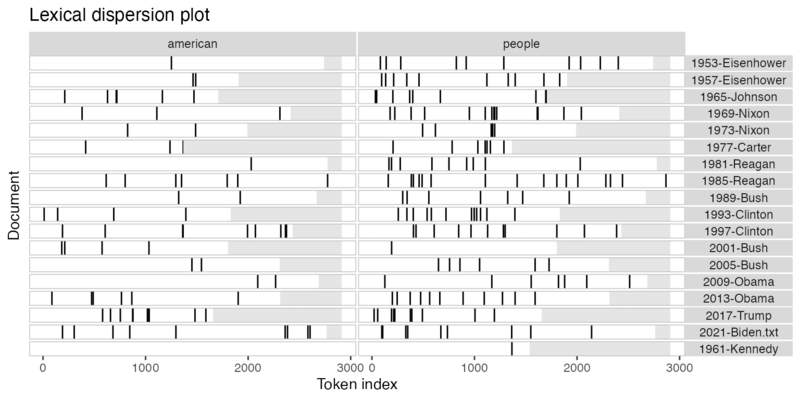 Plotting a kwic object produces a lexical dispersion plot which allows us to visualize the occurrences of particular terms throughout the text. We call these “x-ray” plots due to their similarity to the data produced by Amazon’s “x-ray” feature for Kindle books. If you’re only plotting a single document, but with multiple keywords, then the keywords are displayed one below the other rather than side-by-side. In this case, the texts may not have the same length, so the tokens that don’t exist in a particular text are shaded in grey. You can plot the frequency of the top features in a text using topfeatures. If you wanted to compare the frequency of a single term across different texts, you can also use textstat_frequency, group the frequency by speech and extract the term. # Filter the term "american"
The above plots are raw frequency plots. 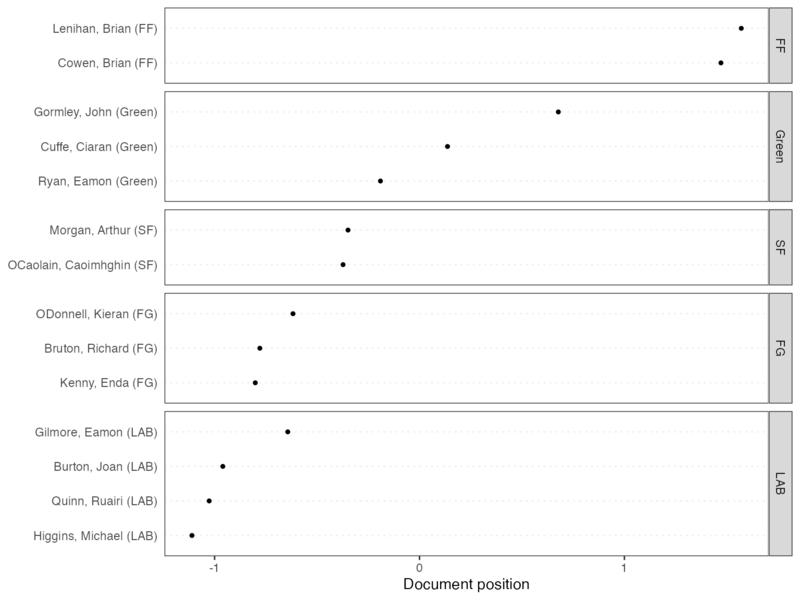 For relative frequency plots, (word count divided by the length of the chapter) we need to weight the document-frequency matrix first. 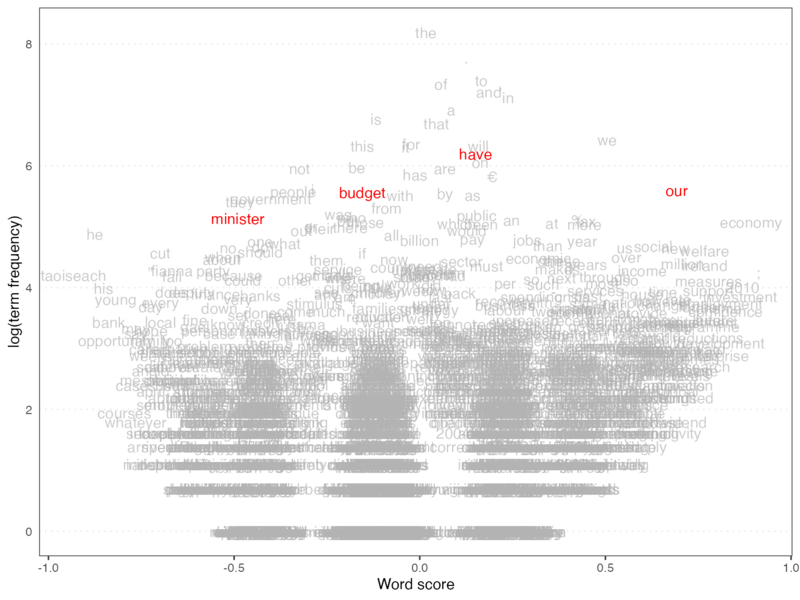 To obtain expected word frequency per 100 words, we multiply by 100. ## Document-feature matrix of: 6 documents, 4,215 features (85.1% sparse). 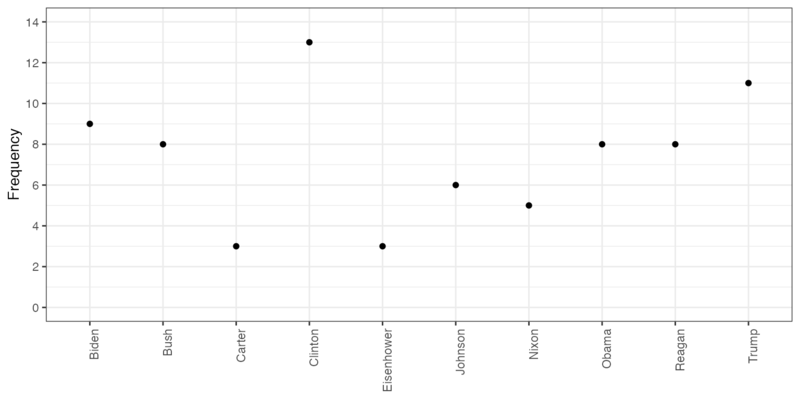 Finally, texstat_frequency allows to plot the most frequent words in terms of relative frequency by group. If you want to compare the differential associations of keywords in a target and reference group, you can calculate “keyness” which is based on textstat_keyness. In this example, we compare the inaugural speech by Donald Trump with the speeches by Barack Obama. 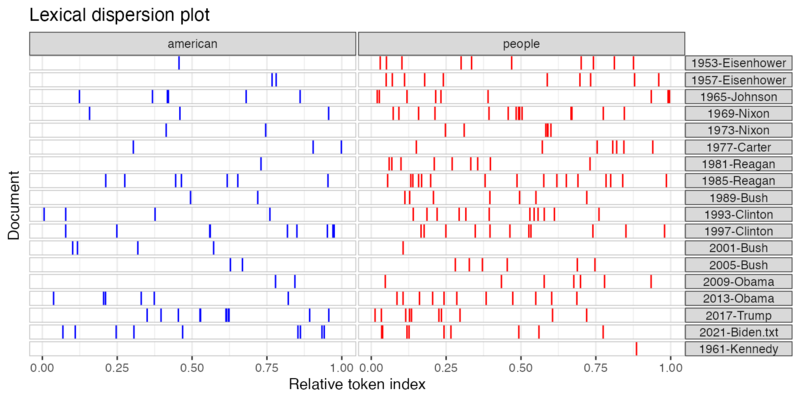 You can also plot fitted Wordscores (Laver et al., 2003) or Wordfish scaling models (Proksch and Slapin, 2008). Wordscores is a scaling procedure for estimating policy positions or scores (Laver et al., 2003). Known scores are assigned to so called reference texts in order to infer the positions of new documents (“virgin texts”). 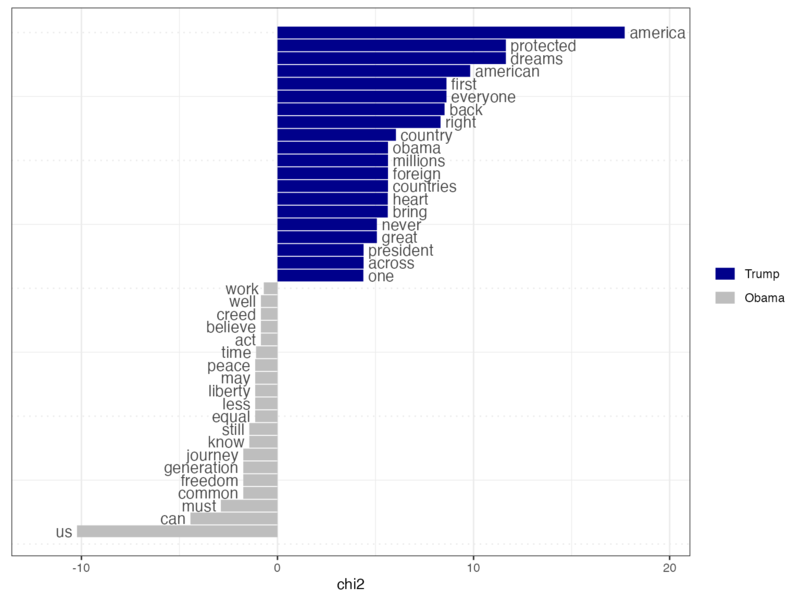 You can plot the position of words (features) against the logged term frequency, or the position of the documents. 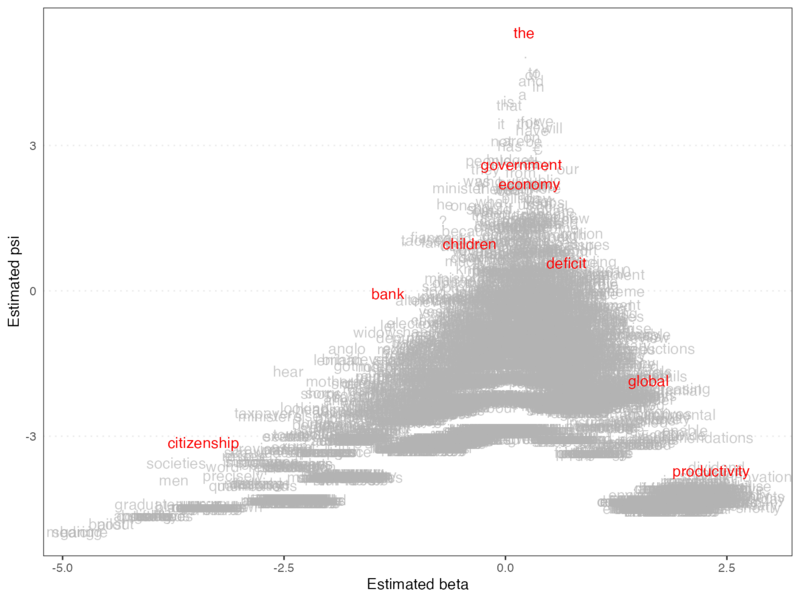 Wordfish is a Poisson scaling model that estimates one-dimension document positions using maximum likelihood (Slapin and Proksch, 2008). Both the estimated position of words and the positions of the documents can be plotted. 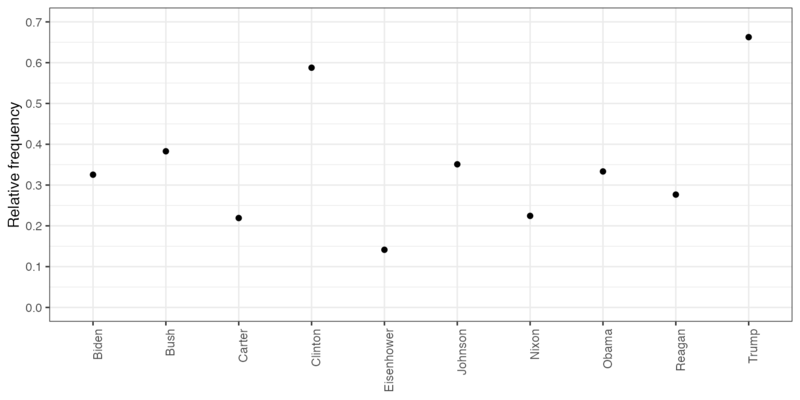 You can also plot the estimated document positions of a correspodence analysis (Nenadic and Greenacre 2007). Laver, Michael, Kenneth Benoit, and John Garry. 2003. 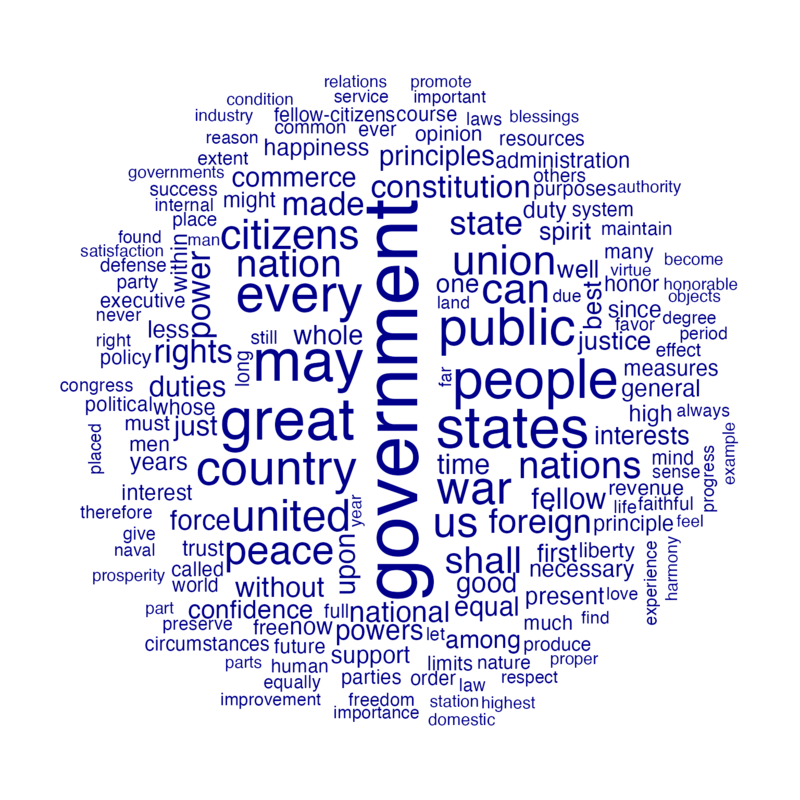 “Extracting Policy Positions from Political Texts Using Words as Data.” American Political Science Review 97(2): 311-331. Nenadic, Oleg and Michael Greenacre. 2007. “Correspondence analysis in R, with two- and three-dimensional graphics: The ca package.” Journal of Statistical Software 20(3): 1–13. Slapin, Jonathan and Sven-Oliver Proksch. 2008. 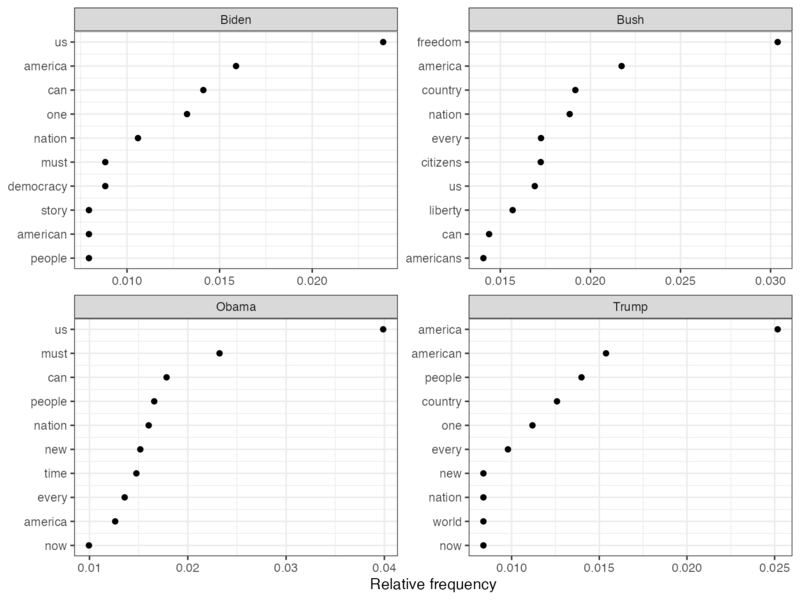 “A Scaling Model for Estimating Time-Series Party Positions from Texts.” American Journal of Political Science 52(3): 705–772.